Precious metals futures advanced Tuesday with several milestones recorded. Palladium finished at an all-time high. Silver closed at a more than eight-week high. Gold logged an about fourteen-week high. Gold for December delivery settled up $12.20, or 1%, to $1,236.80 an ounce on the Comex division of the New York Mercantile Exchange. The settlement is the highest since gold ended at $1,239.70 an ounce on July 16. "The yellow metal was boosted by safe-haven demand amid keener geopolitical uncertainty in the marketplace," Jim Wyckoff, a senior analyst at Kitco Metals Inc., said in a daily report. "Gold prices did back off their daily highs as the U.S. stock indexes moved up from their daily lows." Gold futures ranged from a low of $1,224.50 to a high of $1,243. They declined 0.3% on Monday. Elsewhere, silver for December tacked on 20.6 cents, or 1.4%, to close at $14.793 an ounce. The settlement is the strongest since silver ended at $14.859 an ounce on Aug. 27. Silver futures traded between $14.54 and $14.84. They shed 0.4% on Monday. January platinum gained $12.90, or 1.6%, to $835.40 an ounce, ranging from $820 to $838.20. 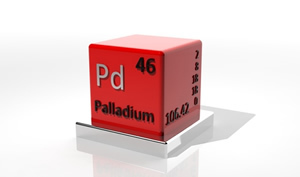 Palladium for December delivery advanced $15.10, or 1.4%, to $1,122.80 an ounce — an all-time record. Palladium prices traded between between $1,104.40 and $1,137.30. Gold gained $13.65, or 1.1%, to 1,235.95 an ounce. Silver rose 8.5 cents, or 0.6%, to $14.715 an ounce.